From the studio that brought you the award-winning Tampa web series The Skyship Chronicles, the feature film Jules Dongu Saves the World, and the award-winning short Magazine Issues, comes another series based on the real-life adventures of our own St Petersburg video production company! Ever wondered what it’s like behind the scenes of a major production company? Well, we just wrapped principal photography on an 8 episode web series that is doing just that. Our Tampa video production crew finishes a night shoot at one of St. Petersburg’s many gorgeous beaches! 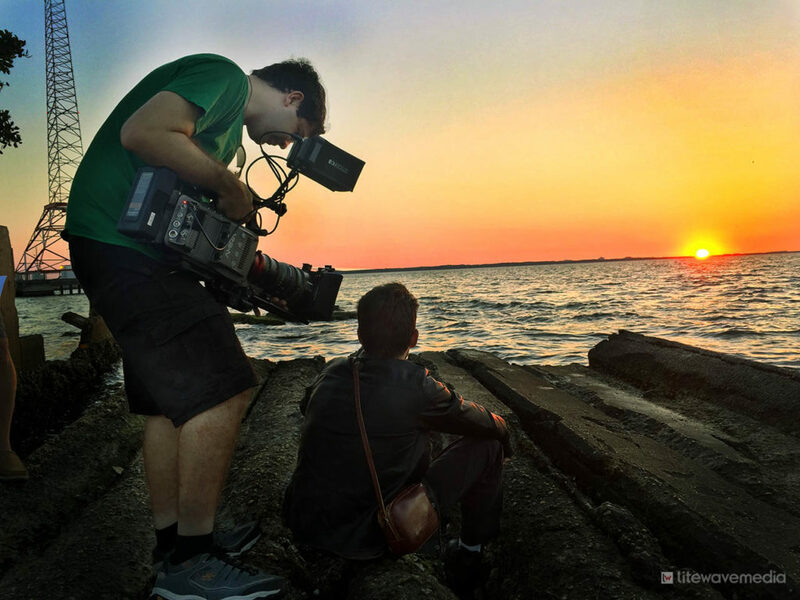 “BTS” (short for behind-the-scenes) utilizes documentary style cinematography to follow a ragtag group of filmmakers as they produce a “big” budget film, along with all the crazy actors, executives, and characters that follow suit. The series takes a satirical look behind the filmmaking curtains to capture the absurd daily life of those working at a film studio as they attempt to produce a sci-fi space opera, combining the adventure of “Star Wars” with the music of “Les Miserables”. It’s a duel at sunset! Filming BTS on St. Pete’s Gandy beach… Or is it an other worldly planet? Litewave Media founder Christian Cashmir initially came up with the idea for the series years ago after experiencing a crazy day on set where everything that happened behind-the-scenes seemed more interesting than the project they were actually filming. In summer of 2016, that idea began to come to fruition when he and co-creator Jason Henne finished mapping out the entire series and sat down with our team of writers to being working on season 1. We approached the St Petersburg/Clearwater Film Commission (FilmSPC) about partnering, and they offered the project a generous grant… From there, it was off to the races! Once our writers had penned their last drafts, it was time to begin pre-production. Series creator and director Christian Cashmir brought in co-producers Briston George and Alissa Schneider, directors of photography Eric Coughlin, Daryn Murphy, and Scott Sullivan, key grip and gaffer Sasha Sebesta, and assistant director Lynne Hansen to helm the series. For the cast, we brought on actors Chris Cavalier from the Oscar-nominated film Hidden Figures, Lucius Baston (Stranger Things, Bad Leiutenant), Owen Harn (The Walking Dead, True Detective), Vivian Alvarez (12 Years a Slave), Chris Jackson (The Inbetweeners), and Alison Burns Jackson, who was a lead in the national tour of the hit musical Rent, as well as a plethora of extremely talented local actors to accompany them! Everyone’s excited for the new arrival. Who could it be?? Director Christian Cashmir giving dance lessons to the BTS cast while filming on the beach. Just look at that footwork, baby! From our equipment package, we filmed the entire first season on our Canon C300 Mk II and C300 Mk I cameras, some Canon L zoom lenses and Canon CN-E cinema prime lenses. We even brought out camera operator Eric Coughlin’s Steadicam to get some more cinematic footage for the “movie-within-a-movie” scenes. Director of photography Eric Coughlin using the Canon C300 MkII camera on our Tampa white cyc studio. With principal photography finished, we’ve now taken all of the footage we have to our Tampa post-production company, where our editors will cut together each of the 8 episodes. Looking forward, we’ll bring in the talented actors to our St. Petersburg recording studio, in which we’ll produce all of the songs for the series’ musical numbers. We’ve got a ton of work left and our team hasn’t stopped yet! It’s ninja beach! Cast and crew sandy, yet happy after a fun day of filming fight scenes on the beach! Stay tuned for more updates as “BTS” progresses. Remember to like our Facebook page for behind the scenes photos and videos as we continue working on the series! In the meantime, check out some of the other work we’ve done, like music videos and commercials! Do you have a St. Petersburg independent film you’d like us to produce? Contact us today for a consultation. Be sure to like us on Facebook. Stay up to date on all St Petersburg video production company news by heading over to our blog.